Mo Wren loves living on Fox Street. There’s something good and interesting about every neighbor, except one…but then, even Mrs. Steinbott, turns out to have a kind heart and a mystery! Author Springstubb introduces characters from Mo’s melting pot cul-de-sac. Da, Mo’s neighborhood grandma, is a big-hearted woman who is beginning to have trouble living alone. Her best friend Mercedes is frustrated with her own family’s changes, a new stepdad. Since Mo’s mom died, she has been responsible for her little sister, Wild Child Dottie. 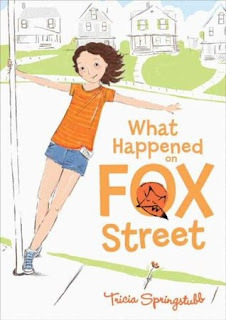 Her father dreams of starting his own business and selling the house; and because of a shady real estate speculator, he may get his chance to sell Mo’s precious Fox Street home. While solving the mystery of Mrs. Steinbott and discovering the Fox Street fox, Mo has to learn to adjust to the changes she dreads. Young readers from third grade through middle school may enjoy reading about Mo’s adventures, friendships, imagination, and loyalties.